This month’s newsletter contains information about a number of recent events, including the Third Meeting of the Intergovernmental Platform on Biodiversity & Ecosystem Services (IPBES-3), a recent symposium held in Japan, a book chapter related to SEPLS restoration, and the official report from last year’s IPSI Global Conference. We are also pleased to share news of a recent article in “The Nature of Cities” partly dealing with SEPLS, and an IPSI case study from partner organization IORA Ecological Solutions in India. As always, we are welcoming submissions of case studies from all IPSI partners, as well as suggestions or contributions for this newsletter. Please contact the IPSI Secretariat at any time with questions or updates about your activities as we look forward to another exciting year promoting socio-ecological production landscapes and seascapes. We would like to offer readers a gentle reminder about the recent Call for Papers for the pilot edition of a planned compilation series of case studies submitted by IPSI members. The theme of the pilot edition will be “Enhancing knowledge for better management of SEPLS”. The IPSI Secretariat plans to publish a compilation of high-quality case studies providing useful knowledge and lessons focusing on a specific theme related to SEPLS. The compilation will also include a synthesis paper in order to contribute to policy and academic discussion, as well as to help make lessons learned practical in the field. Authors from IPSI member organizations who have case studies relevant to the theme are highly encouraged to submit a manuscript by 10 March 2015. For more information, please see the announcement on the IPSI website. Faced with various challenges related to the conservation of biodiversity and sustainable human-influenced environments, solutions relying on the benefits derived from socio-ecological production landscapes and seascapes (SEPLS) require first that knowledge on their revitalization and sustainable management be extracted, consolidated and shared with wider audiences. The theme “Enhancing knowledge for better management of SEPLS” covers topics regarding ways to identify, collect, document, maintain, exchange, refine, augment and make use of information and knowledge for better management of SEPLS. The focus in particular is on tools and approaches used by and with local communities and other stakeholders to deepen understanding of SEPLS and their management. This may include integration of traditional knowledge and modern sciences. IPBES is an independent intergovernmental body open to all member countries of the United Nations, and provides a mechanism recognized by both the scientific and policy communities to synthesize, review, assess and critically evaluate relevant information and knowledge on biodiversity and ecosystems services generated worldwide by governments, academia, scientific organizations, non-governmental organizations, and indigenous communities. The third meeting of the Platform’s Plenary (IPBES-3) was held from 12 to 17 January 2015 in Bonn, Germany. Three members from the IPSI Secretariat participated in the plenary meeting and two days of stakeholder meetings held prior to it. Dr. Kazu Takemoto, Director of the IPSI Secretariat and its host organization UNU-IAS, made a presentation during the stakeholder meetings together with Dr. Suneetha Subramanian, who also serves as a member of the expert meeting on methodological assessments on diverse conceptualization of values of biodiversity and nature’s benefits. Dr. Kaoru Ichikawa, who serves as a member of the Task Force on Indigenous and Local Knowledge (ILK) Systems, also participated in the meetings. They were pleased to see many familiar faces from IPSI member organizations, demonstrating IPSI’s wide reach in the world of international policy-making. Major outcomes of this year’s meeting included the revision of the IPBES work programme and approval of regional scoping documents. The IPBES process is expected to be extremely important for providing scientific information relevant to concepts of the Satoyama Initiative and SEPLS conservation and promotion, and there should be many areas for IPSI members to contribute to IPBES processes, including in regional and thematic assessments and incorporation of ILK in IPBES’s work. More information on IPBES and its events can be found here. An edited academic volume relevant to the topic of socio-ecological production landscapes and seascapes (SEPLS) has recently been published by Springer, edited by Usio Nisikawa of Kanazawa University and Tadashi Miyashita of the University of Tokyo, both of which are IPSI members. 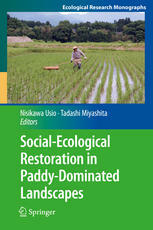 Along with a number of chapters that we are sure will be of interest to many of our readers, the book includes a chapter titled “Socio-ecological Systems in Paddy-Dominated Landscapes in Asian Monsoon” by Osamu Saito and Kaoru Ichikawa of the United Nations University Institute for the Advanced Study of Sustainability (UNU-IAS). 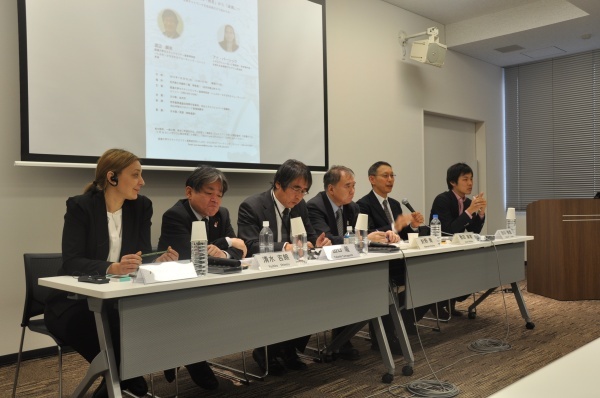 Dr. Ichikawa is also a staff member of the IPSI Secretariat, hosted by UNU-IAS. We highly recommend that anyone interested in SEPLS, landscape restoration, paddy-based agriculture, or any related topics take the time to peruse this volume. It is available from Springer’s website. 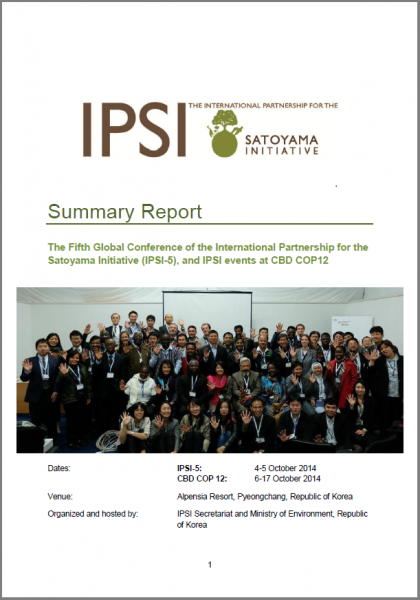 We are proud to announce that the official report has been completed for the Fifth IPSI Global Conference (IPSI-5), which was held from 4 to 5 October 2014 in Pyeongchang, Republic of Korea, back-to-back with the twelfth ordinary meeting of the Conference of the Parties to the Convention on Biological Diversity (CBD COP 12). The report contains summaries of IPSI-5 events as well as IPSI-related side events and other activities that took place during COP 12. Whether you were able to attend the conference or not, please have a look at the report for some of the latest information on IPSI, its members, and activities. The report, as well as reports from past IPSI Global Conferences, is available for download from the IPSI Global Conference webpage here. IPSI member the Secretariat of the Convention on Biological Diversity (SCBD)’s experts Henrique Mercer, Viviana Figueroa, Oliver Hillel and Andre Mader recently published an article titled “The Bright Side of Indigenous Urbanization for Biodiversity” on the website “The Nature of Cities”. The article includes a section on the Satoyama Initiative and SEPLS, particularly satoyama and satoumi in Japan as one model of biodiversity-rich peri-urban areas. The article also received significant contributions from IPSI members UNU-IAS and UNEP. Readers are encouraged to take a look at the article. The IPSI Secretariat recently received a case study report from partner organization IORA Ecological Solutions titled “India Organic Waste Management Programme (IOWMP)”. Waste disposal is a rapidly growing problem in India across rural and urban households, communities and institutions like hostels, hospitals, convents, and old age-homes, etc. Conventional biogas plants have been a failure since these plants are difficult to install and maintain as they require large underground tanks which can rust and develop leakages or blockages. Most biogas programs in India in the past have been unsuccessful due to lack of regular maintenance and service centers. IORA Ecological Solutions (IORA) has developed a comprehensive solution to the waste problem through its innovative model, ‘India Organic Waste Management Programme’ (IOWMP). IOWMP aims to promote clean energy for rural and semi-urban household, community and institutional organic waste management through installation of innovative-patented biogas plants that eliminate all the problems associated with conventional biogas plants. The full case study write-up, including benefits for the environment and human livelihoods in rural areas, can be found on the IPSI website.